CARRICKABRAGHY. O.S. Donegal 3 8 1 and 4. Caraghbraughy, Bragh Carick, etc. ; Castlebrack on Plan of Six Escheated Counties of Ulster. O’Donovan assigns to this place the Lords of Carraic-Brachaidhe, who are mentioned in the Annals of the Four Masters from the 9th to the 12th century; but the castle cannot be so early, and, like Elagh, the name was probably applied to a district. The castle was built before 1600, when it was occupied by Phelemy Brasleigh O’Doherty. Sir Cahir O’Doherty selected it as a secluded place for planning his revolt. It does not, however, appear on early maps, and its main importance seems to date from the beginning of the 17th century, though apart from the inquisition of 1621 it is not mentioned in the records, and was apparently uninhabited in 1665. The sketch on Phillips’ Map of 1690 shows it, with unusual size and detail, as an oval bawn with seven round towers, surrounding a square keep, to the south of which is a small tower, probably belonging to a church, The place is marked as late as Senex’ Map of Ireland (1712). The keep stands on a rocky outcrop on the shore, surrounded by low precipices. To the south west two ridges of rock run out for about 90 feet, and east of them is a hollow now occupied by a cottage, where perhaps the chapel stood. South-east of this hollow is a lower boss of rock, surmounted by the stump of one of the circular bawn towers, about 10 feet in internal diameter. It has walls 3 feet 9 inches thick, and remains of three musketry-loopholes. All other traces of the bawn-fortifications have disappeared, but there seem to be foundations of a wall running east from the outer gate to the edge of the precipice, which would have divided the bawn into an outer and an inner ward. South of the bawn tower is a wide expanse of sand-hills, which may have accumulated since the 16th century, the site being at that time almost an island. The oldest part of the structure is the square keep. The walls of this are slightly battered up to the base of the second floor, and the corner stones tend to be placed alternately with headers upright and stretchers on their sides. There are small bow-loopholes in the south wall of the ground and first floors, and a similar loophole in the north Wall of the ground floor has been rebuilt for musketry. In the east wall of the first Floor, however, is a musketry-loophole with no signs of patching on the inner or outer face. It seems, therefore, that the keep was built at the transitional period when musketry was being introduced, perhaps in the middle of the 16th century. A late date would suit the small bow-loopholes, more degenerate than those of Inch and Buncrana, and probably planned for long-bows. Further, we have seen that the earlier castles of Inishowen are battered only at the base, and the continuous batter of Carrickabraghy may he compared with Elagh IIIn the second period, which belongs to the end of the 16th or beginning of the 17th century, and is probably earlier than the Plantation, considering the obscurity of the history of the site after that time, little alteration was made to the existing structure apart from a few patches and perhaps the building up of a bow-loophole in the west wall of the first floor. A second floor was added to the keep, with perpendicular walls of small stones; but it does not seem that the stairway in the north wall is an addition, so there was probably a parapet round the roof in the first period. The second floor walls are stepped back, and about 1 foot thick. They probably contained musketry-loopholes, but few fragments of them survive. The circular tower does not bond with the keep, and it and the court-yard walls and gates are additions of the second period. This area has been much filled with earth, and the door of the keep must formerly have been approached by steps. 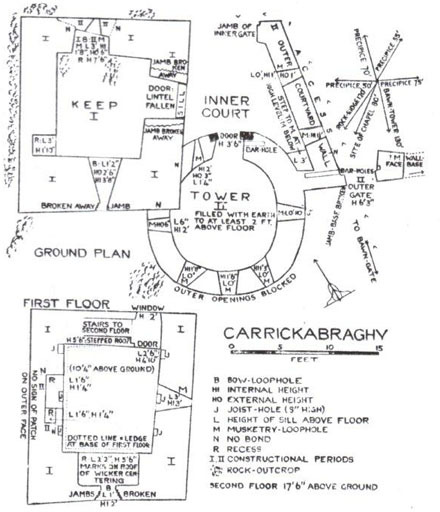 The tower is fitted with rather wide musketry-loopholes, The Walls in general stand 3 or 4 feet above internal ground-level; at a height of 4 feet are traces of the joist-holes of the first floor, and on the south is a fragment of a splayed window belonging to it. The courtyard wall also is fitted with loopholes, and the only approach was by passing from the outer gate beneath it to the inner gate on the north, of which one jamb remains.